"The year 1994. From out of space comes a runaway planet, hurtling between the Earth and the Moon, unleashing cosmic destruction. Man's civilization is cast in ruin. Two thousand years later, Earth is reborn... A strange new world rises from the old: a world of savagery, super science, and sorcery. But one man bursts his bonds to fight for justice! With his companions Ookla the Mok and Princess Ariel, he pits his strength, his courage, and his fabulous Sunsword against the forces of evil. He is Thundarr, the Barbarian!" 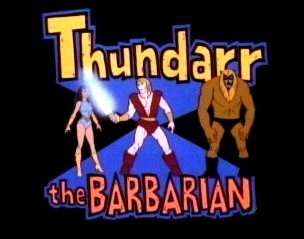 If you like Thundarr, you should also visit the Thundarr the Barbarian web site. Game mechanics adapted from the 1992 edition of Over the Edge ™ (Jonathan Tweet, Robin D. Laws) by Brandon Blackmoor. Over the Edge is a great game by Atlas Games, and you should buy a copy. Portions of this document were reproduced with permission from the Over the Edge role-playing game, and are Copyright © 1992, 1997 John Nephew. Over the Edge is a trademark of John Nephew, used with permission. Thundarr the Barbarian is Copyright © 1981 Ruby-Spears Enterprises, Inc., and is used here without permission.